I rode the GSW Century ride this past weekend. The organizers call it a "ride" not a "race", so I guess I'll be consistent. We woke up at 4 AM on Saturday and were on the road by 6. Hampton Beach State Park was about an hour away and we wanted to get on the road early. When we got there, the place was packed with all sorts of serious riders with even more serious bikes. It made me chuckle at how slick a lot of the riders were with their specialty shorts, helmets and windbreakers. For me, I still wear sneakers (haven't upgraded to the special pedals yet) and I just started to wear biking shorts for longer rides. Clearly they were way out of my league. 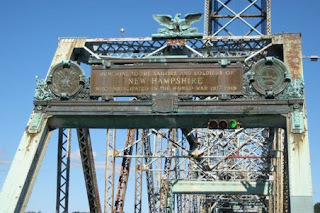 We grabbed a PB&J sandwich and then headed south to Newburyport, Massachusetts. Very early on we realized that the road markings were going to be tough to follow. There was a lone yellow arrow on the road at random places and was often very difficult to see. We knew that we were going to have to be conscious of the poor markings. Oh, if only we knew then how poor the markings would be. The first 16 miles were a breeze. It was still a bit chilly (mid 40s), but not too bad. We got back to the state park and had a decision to make: do we do the entire 100 miles today or break it up over two days? 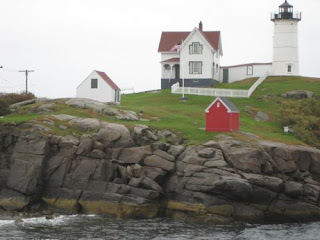 We had planned to do about 60 the first day and then the remaining 40 the second day, while we leisurely made our way up the coast, sampling lobster rolls, beer, and ice cream. But it was supposed to rain on Sunday, so we made the decision to do the full 100 that day. We hit the road again and felt pretty good. We stopped again at mile 30 at a park along Route 1. Still feeling good and after sucking down half a PB&J sandwich, we continued on. In the past, we tended to go for longer rides and then take longer breaks (like an hour or two). Well, if we were going to do the full 100 in a day, our breaks would have to be no more than 30 minutes, and we'd need to be efficient about it. 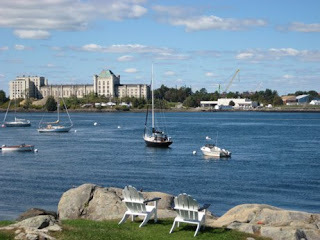 We hit mile 38 and walked our bikes across the bridge into Maine. 12 miles later and we were at a SAG stop where we refilled our water bottles, grabbed some well deserved oreos and fig newtons and then headed out again. I was feeling great, but my friend's hip and knee were starting to bother her a bit. We didn't spend more than 30 minutes at the stop because we were only halfway done. It was after this stop that the wheels came off the wagon, so to speak. 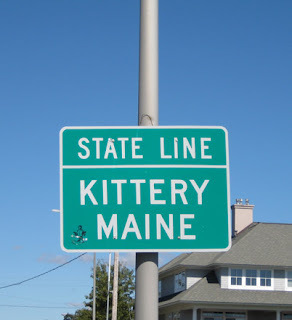 Because they had distances for half-centuries, metric centuries (62 miles) and full centuries, the markings on the road got ridiculously confusing. And not only were the markings bad, but the map was worse. Because of the bad markings, we ended up making a circle back to the SAG stop, which meant that we missed 9 miles out and back (18 total) from the ride to Cape Neddick, Maine. Needless to say, we weren't very happy. But we continued back and told ourselves that we'd just make up the mileage by continuing past the end/start point. We stopped briefly at mile 62 because my friend's hip was killing her. I fueled by consuming some peanut M&M's and gummi bears (the fuel of champions). We headed back to the start. About 10 miles before the end/start point, we hit a tremendous headwind. As in, no matter how low the gear was, you were still fighting to survive. And we barely did. By the time we got back to the start, it was too late to continue the remaining 18 miles, and we were exhausted. We headed to the hotel to shower and re-group. After a good meal and a good night's sleep, we headed out for doughnuts the next morning. Apparently, after the second glazed doughnut, we decided that we should do the remaining 18 miles, despite the rain and wind. We drove to Nubble Point (the lighthouse) and then rode 9 miles out and 9 miles back to hit the even 100. The remaining 18 felt good, especially because we knew we'd be done soon. All in all, I loved doing the Century ride. I probably could have done the century in a day, but it was fine to back it off to the remaining 18 on the second day. Since the ride, I haven't felt any soreness or pain. Clearly that type of thing must agree with me. GSW Seacoast Century Ride: DONE. Whether training for a specific race or just running for the fun of it, we all experience the ups and downs of running. What do you do to get yourself motivated to run when it feels like it's the last thing you want to do? Clearly Lindsay must have known that I had a draft post of this exact question that I had wanted to do since March. So glad you asked! I'm often in a spot where I just don't want to get out of bed. I typically run in the mornings prior to starting my day, so it's almost always a sacrifice of sleep for running. And when I wake up and decide that I really want to stay in bed, I look at a framed picture that is in immediate view. 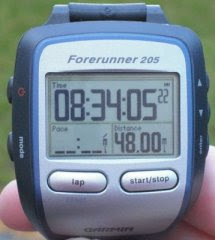 It's a very enlarged picture of my Garmin watch at the end of my 48 Miles in 48 Hours event. It reminds me that if I can run 48 miles over a two-day period, I can get out of bed and run 4.5 in a half-hour. 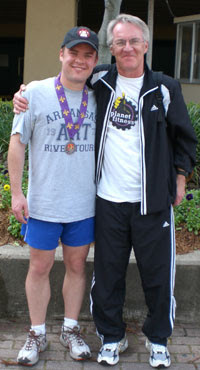 I also look at a picture of my dad and me at the end of my first marathon, the New Orleans Marathon. I look at the pride that he has in me and the huge smile in that picture and it always make me put my sneakers on and get out the door. I think about being able to wear my "skinny jeans" and how much I love wearing those jeans rather than the ones 7 sizes larger. And I think about how I never want to look the way I looked before. I vowed to never get back to that weight, and let me tell you, fear of gaining weight is a fantastic motivator. I think about how much I want to have a big plate of nachos or hot wings later, and maybe a beer or two. And if I'm going to do that, I need to earn those calories by getting out that morning. I also think about how great it felt to donate my "fat" clothes. Over the last couple of years, I've donated at least two dozen garbage bags full of my "fat" clothes. Nothing feels better than giving away clothes that are so big you look like you're swimming in them. Clothes that make you wonder how you were ever that big. And that's what I think about at 5 or 6 AM when my alarm goes off and all I want to do is hit snooze. It gets me out the door and on the road. In a bout to ensure that I do some crazy athletic thing at least every other weekend, I'm riding the Seacoast Century Ride this weekend. As is often the case with me, 100 miles is more than I've ever ridden at one time before, but at least this ride can be done over two days. 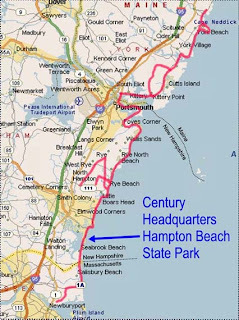 The course starts from Hampton, NH, and then heads south to Massachusetts, and then back north Cape Neddick, Maine. 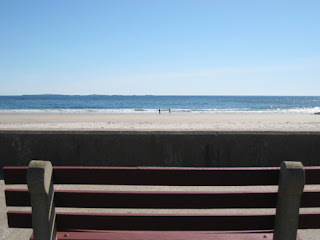 I think we'll head around York Beach, Maine, to see a nice lighthouse. All told, over 2 days, we'll hit the century mark of 100 miles. 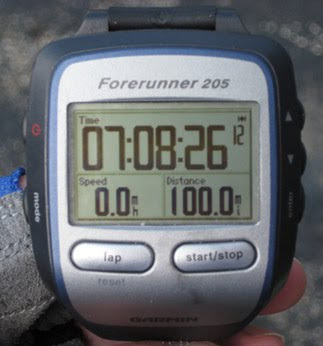 Like my ridiculous 48 Miles in 48 Hours, expect a picture of the Garmin at 100 miles as proof of the insanity. I'm riding with a friend and we're planning our stops around good ice cream and lobster places (not places that serve both ice cream and lobster, though). Ice cream and lobster is the equivalent of GU, right? Right? I did a nice, easy 25-mile ride this past weekend and felt absolutely fine. It was my first post-marathon piece of exercise, if you don't count the frequent trips to the fridge for another well-deserved beer. You don't count that, right? It's odd, though. I don't have a doubt in my mind that I'll be able to do the distance. Something about being in good shape that keeps my stress level low. That, and, well, I don't really get stressed pre-race. I'll try to take pictures this weekend. Should be a very good time. During the opening ceremonies of the marathon, Eric Makovsky talked about a unique fund-raiser for the race organizer, Via, a non-profit that helps children with disabilities. Eric was going to start last, and a company would donate $0.75 for every person he passed. It was especially poignant for him because his 5 year-old daughter has autism, so he's running for her and for the organization. Well, he finished first and passed everyone for nearly a $500 donation. What a great idea (and one that I'll never have). He also sang the national anthem. All told, the race is expected to raise almost $90,000 for Via. 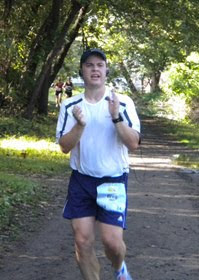 The Allentown Morning Call has a great article about the race and Eric's story. Great job, Eric! My family and friends came over as soon as I crossed the line and sat down. I had asked my family to pick up some soft pretzels because I thought it would calm an upset stomach. Turns out my stomach was good the whole time and I didn't need them. But, man, did they taste good, and they were a nice combination of carbs and salt, so that's never bad. I stretched out a bit and changed my shirt. I was still in shock from my finish and that I had broken 4 hours. 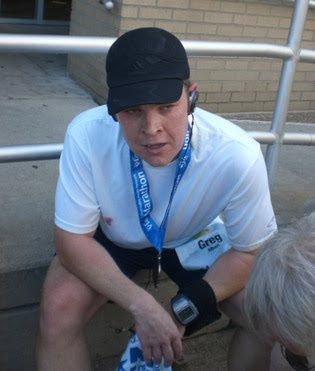 And the amazing part about it was that I was feeling so much better at 4 hours than I did at the end of the New Orleans Marathon after 5 hours. I was pretty lucid and was able to answer questions and figure out what I was doing. It was a nice feeling. We hung around a bit and I walked a bit and then we headed back to my friend's place. I got a shower and we were finally able to start replacing those calories I burned--my favorite part. I ordered a huge cheese steak with a double slice of sicilian pizza as my appetizer. The waitress didn't even bat an eye when I asked for it. And I had some much needed beer and got to relax a bit and bask in my day. I was tired and sore, but it was nothing like the last marathon. I could move and carry on a conversation (between bites, that is). Clearly the miles I had put in had helped immensely. I used my iPod this time, which was a great distraction in the later miles. I didn't use the liquid GUs, but rather the gummy chewy GUs. They kept my stomach from being upset, I think. Loved the gummi bears as a fun distraction. Started at the right pace and kept it the whole time. The course was fantastic. 70% of it was shaded and it was very little concrete, so we weren't getting the constant pounding. Anytime we could have gone up a hill, we didn't. 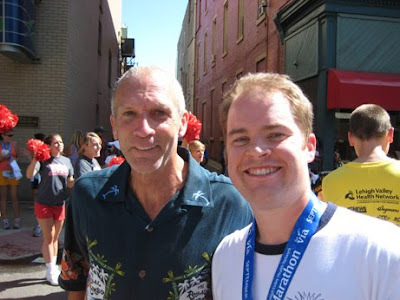 I weighed 10 pounds less for this marathon than the last one. That's 10 pounds of less pressure on my body over 26.2 miles, which I think was a big factor. I put a lot more miles in and a lot more long runs in, despite my hatred of plans. I cross-trained by biking (even doing 35 miles the weekend before the marathon). It helped strengthen my muscles and kept me from constantly pounding the roads. Sneakers were pretty new as I purchased a new pair about 15-20 miles earlier and were the same pair as before. As for lessons learned, I honestly can't think of any. Things went 100% better this time than they did the last time. The course was excellent and the organization couldn't have been any better. It had all the charm of a small-town race with big-city marathon organization. My sincere compliments to the organizers. One somewhat open question, I guess, is if I can do sub-4 marathon without a training plan, what could I do with a training plan? That's a topic for another day, but a good one nonetheless, Petra. The day before the marathon was rather low stress. I had to wake up at a decent time to catch a flight to Newark, but then that's when the "stress" stopped. Flight was right on time and less than an hour--all of which I slept. My friend picked me up at the airport and we grabbed a good sized burger before heading to his place. We then had to venture out again for race packets, but that took less than 45 seconds. My family only lives an hour away, so they came in and stayed over the night before, and they were able to come over for dinner, which was great. Nothing like the calming effect of friends and family to keep your wits about you pre-race. I played my diet very conservatively on Saturday. I didn't want to try anything pre-race that I hadn't had before. Despite the pork and brownies looking amazing, I managed to stick with grilled chicken and a little bit of pasta for dinner. I had already eaten my large meal the night before. I made a point to set everything out the night before and then I tried to get to bed by 10:30 or so because I had to wake up at 5. I tossed and turned a bit, but I think I finally got to sleep around midnight. I woke up once at 4 and then I was ready to be up at 5. I walked downstairs to get my bagel with peanut butter, and I saw the sign my friends made me (see top left). It put a huge smile on my face and I knew that it was going to be a good day. My dad picked me up and we drove the 5 minutes to the starting line (see? small races are great!) and we waited for the start. I stretched a bit and set up my iPod and Garmin, Gu'd up and then was ready to go. Bart Yasso, a running hero of mine (and many others) did the pre-race announcements and then we were ready to go. 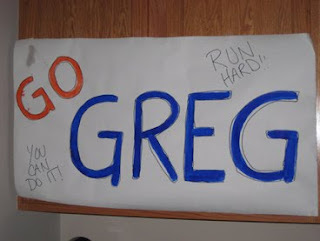 26.2 miles--here I come! The quick stats on the marathon. Full race report to follow. Needless to say, I'm incredibly excited. Never expected to break 4 hours. Ever. I'm looking forward to a relaxing day pre-marathon. All I need to do today is take a quick flight, pick up my race number, and relax. The starting line is only 5-10 minutes away, so I don't have to wake up in the middle of the night, and family and friends already have their "instructions" about where to stand. I'm beginning to see the charm of a small town race. I'm also really excited about running through areas that I used to know well. It'll be really exciting, but probably emotional, too, because I really miss Allentown. If you're interested, I'm going to try to do updated on Twitter every 5 miles or so, because I can guarantee a small race like this doesn't have live tracking. If you're interested, you can follow me at http://www.twitter.com/gregalbert. See you on the other side of marathon #2. So I'm now about 4 days from my second marathon. So, as you might expect, I'm at the point of phantom marathon pains. I'm sure you all know what I'm talking about before a big race. When did my foot start aching? Did my knee always feel like this? I've got to believe that it's part of taper neurosis. I'm planning to just try to embrace it while I try to determine how many Snoop Dogg songs I can get on one playlist. Also, is the band "OK Go" a good transition from rap? Only time will tell. 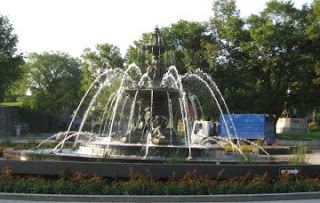 A couple of weeks ago, I took a vacation to Montreal and Quebec City. Two very beautiful cities. 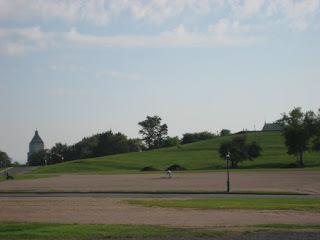 As much as I liked my run in Montreal, I fell in love with my two runs in Quebec City. 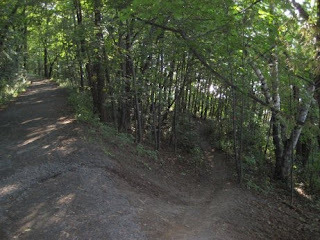 Artillery Park has a nice set of "nature trails" that help the early morning joggers beat the heat. 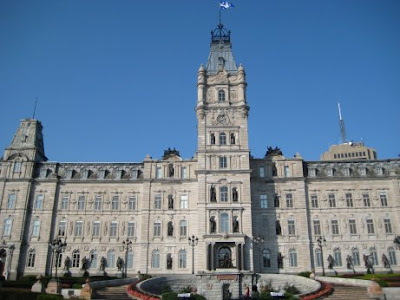 Quebec City has a very strong French influence, much more so than Montreal. Everything started in French and then quickly moved to English once they heard my French. I think they appreciated that I tried. Anyway, about 10 years ago (yikes, it's been that long?? ), I had 3 years of French in high school. I still remembered a lot of it, so I was able to at least understand the questions even if I wasn't able to respond all that well. While most of the questions surrounded food, my favorite phrase came from a run my first morning in Quebec City. As I was running out of the park, saying "bonjour" to everyone I passed (see? I'm trying), a french gentleman ran passed me and said "what a great day to be alive" (in French, of course). Since my brain hadn't processed it yet, I just yelled "oooooouuuuuiiiiiii" as I passed him. It took me a second to translate it and then I smiled all the way back to the hotel. What a great day to be alive, indeed! I've mentioned in the past how much I love running when I travel, and I always take my camera. Below are some pictures from the trail, a larger view of the park, and then some famous hotel (the name of which escapes me).